Joint Entrance Examination, JEE Main 2019 result is expected soon. National Testing Agency, NTA had released the answer keys for the April examination on April 14, 2019. The objections for the same were collected till midnight on April 16. Post the objections, NTA is now expected to release the JEE Main Result 2019 on jeemain.nic.in. NTA has released an important notice for all the candidates who have appeared for the JEE Main examination – both in April and January 2019. As for the result of JEE Main 2019 Paper II, the scheduled date of release is on or before May 15, 2019. NTA would release the common rank list as well as a rank list for various categories. About, 2, 45,000 candidates would be shortlisted for the IIT JEE or JEE Advanced 2019 examination. National Testing Agency, NTA will release the Joint Entrance Examination, JEE Main 2019 Paper II Results soon on its website. Candidates who have appeared in the JEE Main 2 written examination can check the official site of JEE Main at jeemain.nic.in for results. The JEE Main II examination was to be conducted on April 7 to 12 i.e JEE Main II Exam Paper I would be held on APril 7 and JEE Main Exam Paper II would be held on April 8, 9, 10, 12 across the country. NTA would release JEE Main II Exam Paper I result on April 30, 2019. The JEE Main I examination was conducted on January 08, 2019 to January 12, 2019 across the country. NTA has already released JEE Main Paper I result on January 19, 2019. National Testing Agency (NTA) has announced the JEE Main 2019 Paper 2 result on its official website. Candidates, who have appeared for the NTA JEE Main 2019 Paper 2 examination, can check their results by visiting the official NTA website - jeemain.nic.in. A. JEE Main Paper 1: JEE Main Paper 1 is for candidates appearing for admission to BE and BTech courses. It will contain objective type questions (both online and offline) in physics, chemistry and mathematics. 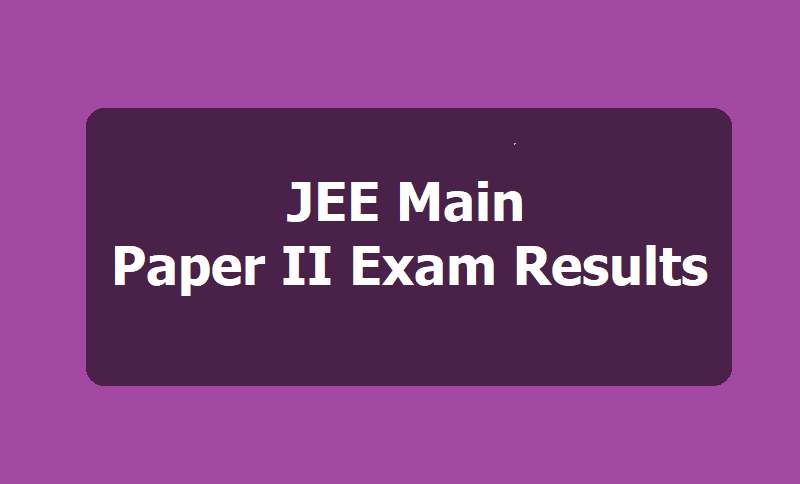 B. JEE Main Paper 2: JEE Main Paper 2 is conducted for students who wish to pursue BArch or BPlan. This paper will solely be conducted in the pen and paper mode and will include objective type questions in mathematics, an aptitude test and a drawing test. From this year, the Joint Entrance Main (JEE Main) examination would be conducted twice a year, the first JEE Main I Examination was held from January 6 to 20, 2019 and the second JEE Main II examination will be held from April 7 to 12, 2019. Step 1: Visit the official site of JEE Main at jeemain.nic.in. Step 2: Click on JEE Main 2019 Paper II NTA score link available on the home page. Step 3: Enter the registration number and click on submit. Step 5: Download the result and preserve it for further reference. A total of 1,80,052 candidates have registered for JEE Main paper II exam. The examination is conducted twice a year- in January and in April. The National level engineering entrance examination is conducted for candidates who want to take admission in architectural courses in national colleges and universities. Candidates who want to fetch more information can check the official site of JEE Main for details.